You’ll be seeing a lot more on the roads in the coming weeks. DRIVERS ARE BEING asked to exercise patience with slow-moving vehicles on our roads as the busy farming season gets underway. Motorists are also being warned to reduce their speed as soon as they see a slow-moving vehicle. 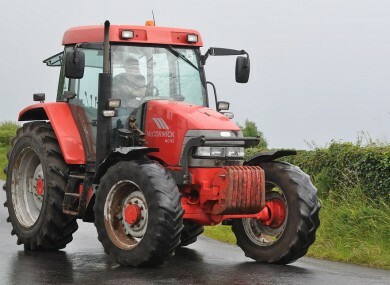 The advice from Mayo County Council said car users, who will often drive at comfortably on country roads at speeds of up to 80kph, will “find their heart rates soaring and steam coming out of their ears” when they end up behind a tractor driving at its top speed of 45kph. If you do get stuck, it’s not going to take up a lot of extra time. “Even if you have to slow down to 30 kph and follow a tractor for two miles, it only takes six minutes of your time, which is equivalent to waiting for two traffic lights,” road safety office Noel Gibbons said. Farmers will often pull-in to allow cars by, but some time is often needed to find an appropriate space to do so. They are being advised to pick off-peak times to head out on the roads. If you are driving behind a tractor, Gibbons advises motorists to make sure to only pass the vehicle when it is safe to do so, and to make sure the vehicle isn’t turning, as many have to make wide left-turns. “Begin to reduce your speed immediately after seeing a slow moving vehicle emblem,” the advice adds. “The next time you find yourself sharing the road with farm equipment, take a moment to appreciate the farmer’s life and be thankful for the food they provide,” Gibbons. Between 1996 and 2000, as many as 70% of fatal road collisions took place on rural roads. Email “Stuck behind a tractor? Appreciate that they're providing your food, say road chiefs”. Feedback on “Stuck behind a tractor? Appreciate that they're providing your food, say road chiefs”.